Personalised with an embroidered name or initials. Select the letter font style and embroidery thread colour you would like sewn. Useful apron for baking, cleaning or arts and crafts and is made from 65% Polyester and 35% Cotton mix. 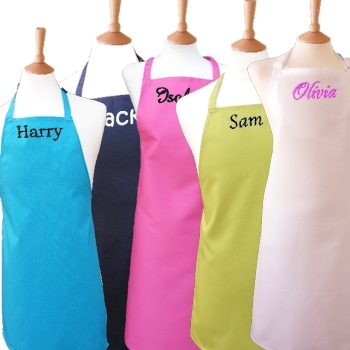 Please choose the size and colour of apron you would like, the embroidery thread colour and font style. This apron is available in two sizes: Small 43cm wide by 53cm length (fits approx 3-6 years). Medium 48cm wide by 63cm length (fits approx 7-10 years). Size: Small 43cm wide by 53cm length. Medium 48cm wide by 63cm length.